National Forests are managed for multiple uses and values. This means that your National Forests provide a wide range of recreation experiences, from developed campgrounds and historic sites to remote, untrailed Wilderness -- and a range of experiences in between! The Hiawatha National Forest's recreation niche can be summed up in the tag line "Your Great Lakes National Forest," which refers to our "Great Lakeshores, Great Lighthouses, Great Islands and Great Snow." Our lake-effect influenced environs provide rich opportunities for Forest visitors to enjoy sightseeing, trails, interpretive programs and more. Visit our Recreation pages to learn more about recreation opportunities provided on the Forest. Hiawatha National Forest is host to six Congressionally-designated Wildernesses. To learn more about these primitive areas, see our Special Places page. Like other federal land management agencies, the Forest Service manages a variety of cultural resources. Proximity to three Great Lakes has influenced the history of the Upper Peninsula's people since the glaciers gouged out the Lakes 10,000 years ago. The Hiawatha National Forest manages many heritage features including those at Whitefish Bay Scenic Byway, several lighthouses located around the Forest, Bay Furnace Historic site and more. On Saturday, June 27th, Hiawatha National Forest Supervisor, Tom Schmidt, hosted a Grand Opening celebration for the new Moss Lake Off-Road Motorcycle Trail located approximately 3 miles north of Nahma Junction. The 27-mile trail, intended for single-track motorcycle use, was developed in partnership with U.P. Sandstormers and the Michigan Department of Natural Resources. Schmidt noted, "Opening a trail to the public is not a simple, overnight task, and this trail is no exception. There has been a lot of effort and outstanding commitment from our project partners. Their dedicated efforts have been critical." Jeff Magowan with U.P. Sandstormers Motorcycle and ORV Club, also commented on the completion of the trail. "We are excited about the Grand Opening event - it is the culmination of many years of cooperative effort," said Jeff. In addition to their work in planning and obtaining the funds and labor necessary to build the trail, the U.P. Sandstormers will be responsible for the future maintenance of the trail. "We are proud to be actively involved in making this riding opportunity available to the public," commented Jeff. "We invite area riders to show their commitment by joining us in future trail maintenance efforts." The Michigan Department of Natural Resources funded the environmental analysis and trail construction through its ORV Trail Improvement Grant program, and has committed to fund the future maintenance of the trail. The new motorcycle trail will fit nicely into the State's network of Off Highway Vehicle (OHV) riding opportunities and will add a single-track option to the list of public trails in the Central UP. More than fifty people attended the grand opening celebration, including partners, Congressional contacts, media and interested public. The ribbon-cutting ceremony and partner presentations were followed by a trail ride on the new trail. "We had many excited, positive comments from riders," explained Anne Okonek, Assistant Ranger for Public Service on the Rapid River/Manistique Ranger District. "It was a great compliment to our partners, who were so instrumental in making the trail a reality." The Moss Lake Motorcycle Trail is located one mile east of Forest Highway 13 on Forest Road 2231, which is approximately 3 miles north of US Highway 2. Once again, the Hiawatha’s Heritage and Botany programs teamed up to stabilize erosion caused by illegal OHV use. This year the event was opened with a smudging ceremony, a traditional blessing ceremony, conducted by two Anishinaabe elders who lived at the site of Sandtown when they were children. The site of Sandtown is located on the west side of the Sturgeon River, opposite the town site of Nahma. Between 15 to 25 Anishinaabe families occupied the site during the height of the logging era in Upper Michigan. At that time, residents of Sandtown worked in the lumber mill and logging camps operated by the Bay De Noquet Lumber Company that was headquartered in the town of Nahma, MI located at the mouth of the Sturgeon River near the head of Big Bay De Noc. The site is considered sacred by the descendants of the Sandtown community as it represents a time in Anishinaabe labor history when families literally and figuratively worked to stay together in the wake of Federal Indian policies and programs designed to destroy their cultural beliefs and disrupt their family and community relations. The planting crew for the 2016 event was comprised of FS employees, the YCC crew, and employees of the Lake Superior Watershed Group. This project was funded in part by the Historic Preservation 50 initiative, and RO support was key to its success. 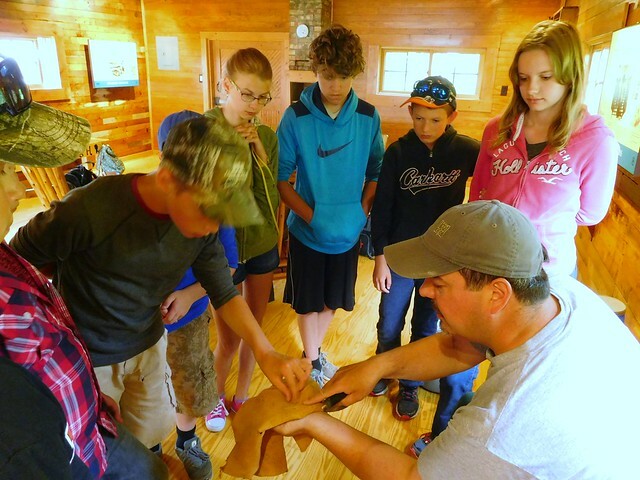 In July the Forest hosted the 2016 Youth Archaeology Workshop on Grand Island. Over the past 18 years, this remarkable program has resulted in at least 3 youth eventually pursuing graduate degrees and professional careers in archaeology! This year, 10 area youth ages 11 to 15 spent three days with Forest Service Archaeologist and Heritage Program Manager, Eric Drake, conducting archaeological investigations on Grand Island National Recreation Area. Students conducted an archaeological survey on the island and also excavated a 1,500- to 2,500-year-old site that was being threatened by erosion. The results of the work will assist the Forest in relocating a campsite and evaluating a heritage site for the National Registor of Historic Places, respectively. Students also gained hands-on experience with experimental archaeology as they learned to make stone tools and cordage from natural plant fibers found on the island. At the same time they explore the history of our Great Lakes peoples, they also learn ethics and techniques involved in the art and science of archaeology. Eric Drake was assisted by the Hiawatha’s Interagency Education Specialist, Melissa O’Donnell, as well as three volunteers who participated in the 2015 Grand Island/Illinois State University Archaeological Field School. This year the Hiawatha National Forest hosted a Passport in Time (PIT) project at Coalwood, an old Cleveland Cliffs Iron Company logging settlement. Passport in Time, a volunteer archaeology and historic preservation program of the Forest Service helps preserve the nation's past with the help from the public. Forest Service archaeologists and historians take volunteers from across the nation on projects to restore prehistoric and historic sites. The PIT volunteer crew for the Coalwood PIT project, consisted of 8 volunteers from as far away as Florida. The crew tested one of the boarding house sites, which was historically occupied primarily by Finnish immigrants (1900-1912). The project is a collaborative effort with Michigan Technological University. [Kate, I’ve asked our heritage staff to expand on this “tweet-sized description” but for now we can use this text as a placeholder.] This project was funded in part by the Historic Preservation 50 initiative, and RO support was key to its success. We often refer to the Hiawatha as “Your Great Lakes National Forest.” The Forest’s proximity to three of the Great Lakes affects the cultural and natural heritage of our landscape. Lighthouses (6 of them!) are among the unique cultural resources found on the Hiawatha. The preservation and interpretation of these signature historic structures is an important component of the work we conduct on the Forest, but the continual need for maintenance is sometimes a challenge. In search of new ways to address the need, this summer the Forest is taking steps to improve future prospects for two of its lighthouses. 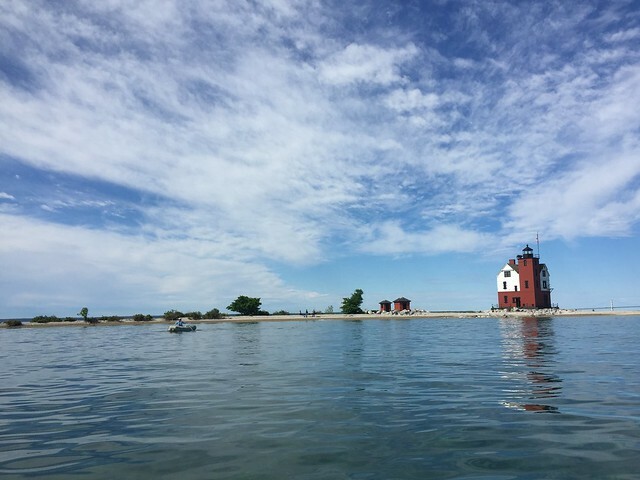 Situated on Round Island in the Straits of Mackinac in view of the Mackinac Bridge and along the ferry route to Mackinac Island Historic Park, Round Island Lighthouse is easily the most-viewed historic structure on Hiawatha National Forest. The Forest is thrilled to announce that in June a crew of historic structures experts and engineers made the difficult passage to the little island in order to inventory the maritime structure. Led by Hiawatha heritage program manager Eric Drake, the crew gathered data that will be compiled into a Historic Structures Report, which is a key tool to assist the agency and partners involved in management and grantwriting for restoration of the structure. Often required for grant applications, Historic Structures Reports are a standard way of documenting the story, condition and future vision for a historic building. Similar data gathering was also begun for the Point Iroquois Light Station. “Our iconic lighthouses represent the maritime history of our area. We are very excited that the completed reports will benefit these structures by helping us partner more successfully for their maintenanace,” said Forest Supervisor Cid Morgan. Next year, the nation will celebrate fifty years of the National Historic Preservation Act. Signed by President Johnson in October 1966, NHPA set the stage for preservation of the nation’s irreplaceable historical and cultural resources. This summer, with that anniversary milestone on the horizon, Hiawatha National Forest, its partners, and volunteers undertook restoration of the historic Mather-Klauer Lodge located on Grand Island, Michigan. The Lodge, a key structure within the scenic and historic landscapes of Grand Island National Recreation Area, helps tell the story of the Island’s past resort era. The Mather-Klauer Lodge was built in 1901 by William Mather, CEO and president of the Cleveland Cliffs Iron Company, which had purchased Grand Island in 1900. An addition to the structure was constructed in 1912, doubling the size of the lodge that served as Mather’s private hunting camp and summer residence until he sold it to the Klauer family in the 1930s. The Forest Service purchased the Lodge in 2012 from a descendant of one of the resort’s caretakers. The Forest uses the facility as an archaeological base camp and museum from which the island’s history is interpreted for the public. The Mather-Klauer Lodge Restoration Project was conducted in partnership with Historicorps, the Passport In Time program, and Illinois State University. The Forest Service provided funding for the project in honor of the 50th anniversary of the National Historic Preservation Act, along with additional funds provided to Illinois State University by the William Mather Foundation and members of the Klauer family. “We appreciate all of the partners and volunteers who recognized the importance of the Mather-Klauer Lodge and stepped forward to contribute,” states Acting Forest Supervisor, Richard Periman. Historicorps is a national organization that specializes in the restoration of historic structures and works through partnerships to mobilize volunteers for historic preservation projects. 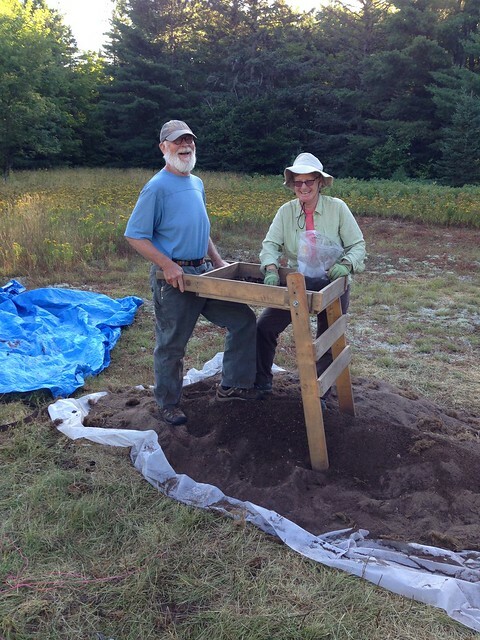 Passport in Time is a volunteer archaeology and historic preservation program of the US Forest Service. Illinois State University, has been an invaluable partner in archaeological research, public education, and historic preservation on Grand Island since 2001. Leading the charge for the Forest Service was Hiawatha National Forest archaeologist, Eric Drake, who envisioned the project and who sought partners to bring the vision to reality. “The restoration crew consisted of two Historicorps project leaders and fifteen volunteers who traveled to Grand Island from locations across the country including Michigan, Indiana, Illinois, Wisconsin, Wyoming, Montana, and Oregon,” notes Drake. Each volunteer spent one to two weeks camping on site while helping to replace and repair rotten sill logs, repair the daubing in the log walls, clean and repoint the stone foundation, rehabilitate the windows and dormers, rebuild the deteriorated brick chimneys, and replace the missing balustrades around the front porch. The project was completed the day before the 25th anniversary celebration for designation of Grand Island National Recreation Area. Over seven hundred visitors ferried to the island the following day to enjoy its stunning cliffs and beaches, and to observe the results of the restoration efforts. Among those visitors was Billie Lindquist, granddaughter of carpenter George Leiphart, who built the 1912 addition. The value of this project transcends the restoration of the Mather-Klauer Lodge, however. As Drake so eloquently puts it, “Hidden within the log walls and refurbished windows of the Lodge. Hiawatha archaeologists investigate the daily life and labor of an early 20th century Anishinaabe logging camp with a volunteer crew of descendents of the camp's original operator. The expansion of U.S. industrial society into the Upper Great Lakes during the late nineteenth century affected the organization of Anishinaabe (i.e., Odawa, Ojibwa, and Potawatomi) life and labor in a number of socially and economically significant ways. Paramount was the transition from self-sufficient producers during the fur trade to market-dependent wage laborers. Struggling to negotiate this time of transition, many Anishinaabeg pursued work opportunities provided by the logging industry as a means to ensure the survival of their households and communities. While some found employment with sawmills, others worked in the logging camps and even established their own logging operations as independent loggers, or "jobbers," who worked under contract with the lumber companies. In 2002, archaeologists with the Hiawatha National Forest initiated the Sandtown Historical Project, designed to explore the nuanced ways in which members of one late 19th- and early 20th-century Anishnaabe community negotiated the tensions and demands of industrial capitalism by articulating logging and sawmill work with other kin-based social and economic practices and pursuits (e.g., hunting and trapping, maple sugaring, fishing, berry picking, and the sale of traditional craft items). The Anishinaabe community of "Sandtown" grew up on the opposite side of the Sturgeon River from the lumber town of Nahma, Michigan, located along the north shore of Lake Michigan at the head of Big Bay de Noc. The town was established by the Bay de Noquet Lumber Company and derives its name from the Anishinaabe word for sturgeon, "nahma." The company logged the Sturgeon River basin and operated a sawmill in Nahma from 1881 to 1951 when the entire town went up for sale. Today, the former site of Sandtown is located on public lands managed by the Hiawatha National Forest. The Sandtown Historical Project is a multifaceted endeavor combining documentary research with archaeological testing of Anishinaabe jobber camps and oral interviews with former Sandtown residents and their descendents. In the summer of 2007, Forest Service archaeologist and heritage-SCEP student, Eric Drake, conducted archaeological testing at one of three known Anishinaabe jobber camps with a small crew of volunteers to determine the site's eligibility for the National Register of Historic Places. The site was operated sometime between 1928 and 1932 by Adam Lambert, who was born near Nahma in the late 1880s and proved to be one of the more successful jobbers working for the Bay de Noquet Lumber Company between 1921 and 1932. Most of the Native Americans who worked in the local lumber industry, including the Lambert family, are descendants of the original Ojibwa and Odawa inhabitants of northern Michigan who ceded vast areas to the United States by treaty in 1836. The volunteer archaeology crew was comprised of two of Adam Lambert's grandchildren, Beverly Louis and her brother Clifford Lambert, Jr. The small crew of three focused its efforts on investigating the function of seven structural features located at the site. Through a combination of describing the associated artifacts found on the surface, and the systematic excavation of shovel tests inside the earthen berms which outline the structures, the crew was able to identify the location of the cook's camp, the men's bunkhouse, the barn, a machine/tool shed, and the living quarters for Adam Lambert and his family. Although the analysis of the recovered artifacts is ongoing, the assemblage reveals that the structures were wood framed with tar paper covered roofs, were heated with wood stoves, and lit with kerosene lanterns. Objects of note include an alarm clock and eating utensils from the cook's camp, pocket change and items of personal adornment from the men's camp, and tools, like files, from the machine/tool shed. Further test excavations of three sub-floor cellar pits were conducted later in the Fall of 2007. Oral interviews with former Sandtown residents suggest that the labor force for the Anishinaabe logging camps consisted of extended family groups comprised of men, women, and children, and at times as many as four generations. The presence of families in these camps is further confirmed by photographs provided by the Lambert family and previous excavations of similar Anishinaabe camps located on the Hiawatha National Forest. The Anishinaabeg were not the only ethnic group to bring their families into the logging camps. The Finns, for example, were notorious for being "clannish" as their camps were also comprised of closely related immigrant households. The difference, however, is that unlike their Anishinaabe counterparts, Finnish families and cultural practices were never the target of federal "civilization" programs (e.g., the BIA boarding school system) designed to disrupt and discourage Anishinaabe family structures, language, religious beliefs, and communal forms of ownership. Consequently, the Anishinaabe logging camps became more than just sites of industrial logging; they became sites of social refuge where family members literally and figuratively worked to stay together. Unfortunately, the father of Beverly Louis and Clifford Lambert did not tell many stories to his children about his childhood in the logging camps. However, like his father, he often took his children into the woods to cut cedar posts and pulpwood when the markets were good, as well as to collect pine boughs and evergreens to make Christmas wreaths and funeral garlands. Excavating sites like the Lambert Camp, therefore, provides a unique opportunity to examine the silenced past of a people who struggled to maintain their families, communities, and sense of identity in the face rapid political, economic, and social change. Indeed, as Mrs. Louis asserts, "my grandmother, Marian Lambert, died before I was born, and I only vaguely remember my grandfather. Visiting these camps, touching the artifacts and the ground where they walked, gives me the opportunity to communicate with my grandparents in a way I never knew possible. "I want to learn everything I can about my family's history," she laughs. "Even the skeletons in their closet." The Hiawatha Heritage team, together with members of the Lambert family, will continue its cooperative pursuit of the past in 2008 with the mapping and documentation of a second, older jobber camp that was also built and operated by Adam Lambert. The long-term goal of this research is to see both Lambert camps listed on the National Register of Historic Places, which will help the Hiawatha National Forest better manage these unique sites for future generations.